A fuel cell converts chemical energy into electrical energy via hydrogen combustion. Though it is considered to be a clean technology – because it does not emit greenhouse gases – fuel cells do use costly rare metal catalysts1, such as platinum, to oxidize hydrogen and reduce oxygen. In recent years, the identification of biocatalysts, enzymes with remarkable properties, has revitalized research in this area: their oxygen, and especially hydrogen, transformation activity is comparable to that of platinum. Hydrogenase activity was, until recently, inhibited by oxygen and therefore incompatible with use in cells. For several years, researchers in the Laboratoire of Bioénergétique et Ingénierie des Protéines (CNRS/Aix-Marseille Université) have been developing a new generation of biocells. They have replaced the chemical catalyst (platinum) with bacterial enzymes: at the anode2, hydrogenase (key for converting hydrogen into many microorganisms), and at the cathode3, bilirubin oxidase. They have now identified a hydrogenase that is active in the presence of oxygen and resistant to some platinum inhibitors like carbon monoxide. 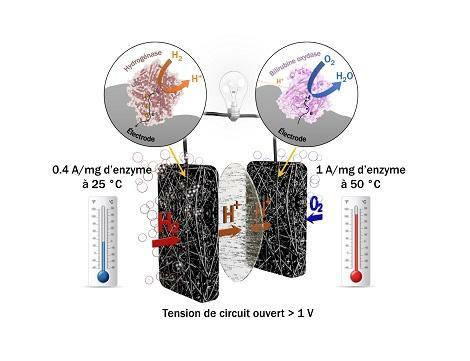 In collaboration with the Centre de Recherche Paul Pascal (CNRS/Université de Bordeaux), they also explored biodiversity to identify heat-stable enzymes that can withstand temperatures between 25°C and 80°C. To shift these bioprocesses from the laboratory to industrial development two major hurdles had to be overcome. In 2014, their first prototype was limited by both the low power it generated and by lack of enzyme stability. So they needed a change of scale, yet had to retain the enzymes' activity and protect them from any inhibitors. A third major problem was how to reduce costs, so among other things, they had to minimize the amount of enzyme used. All of these issues required fundamental and multidisciplinary study intended to shine light on the factors that limit bioelectrocatalysis. By progressively incorporating the two heat-stable enzymes in a carbon-based architecture, the researchers solved these three problems. A carbon felt with suitably adapted porosity is the host structure for the enzymes, and also serves as protection against chemical species generated when oxygen is reduced, which change enzyme activity. So the cell can function without loss of performance for several days. Using this controlled architecture and enzymes' intrinsic properties, the researchers have managed for the first time to quantify the proportion of enzymes participating effectively in the current, demonstrating that the currents delivered by the biocatalyst are very similar to target results for platinum. They have also developed a numerical model to determine the cell's optimal geometry. So these biocells appear to be an alternative to classic fuel cells: biomass can be used to provide both the fuel (hydrogen) and the catalyst (the enzymes), which are by nature, renewable. A catalyst can activate or accelerate chemical reactions. Electrode where an oxidation reaction occurs. This is the negative pole in an electric cell. Electrode where a reduction reaction occurs. This is the positive pole in an electric cell.